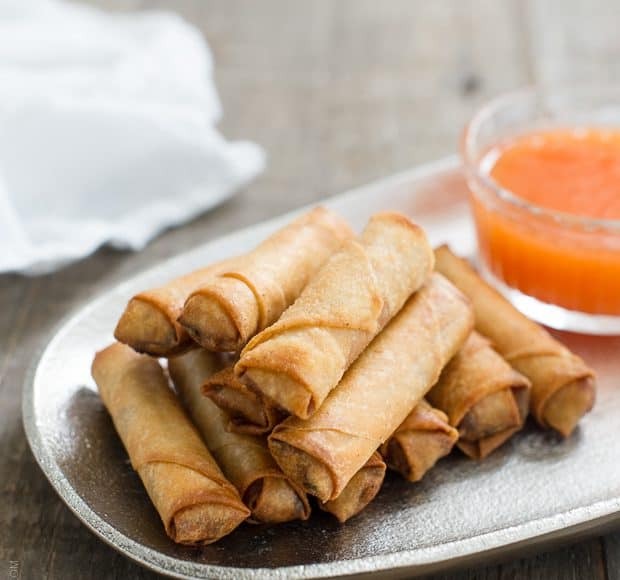 There’s a reason why Lumpiang Shanghai – Filipino Spring Rolls (Lumpia) — are the hit of every Filipino family gathering! These lumpia are filled with pork, shrimp and vegetables, and are as much fun to make as they are to eat. The last time I made Lumpiang Shanghai, I was still in grad school, and to celebrate the end of another year of three hour sleeps, grueling defenses, and grant proposal writing, my small cohort threw a progressive dinner. I needed a dish I could prepare in advance, one that would share a taste of home, and one that I knew was guaranteed to be well loved. There was never a doubt – Lumpiang Shanghai is most people’s gateway to Filipino cuisine. 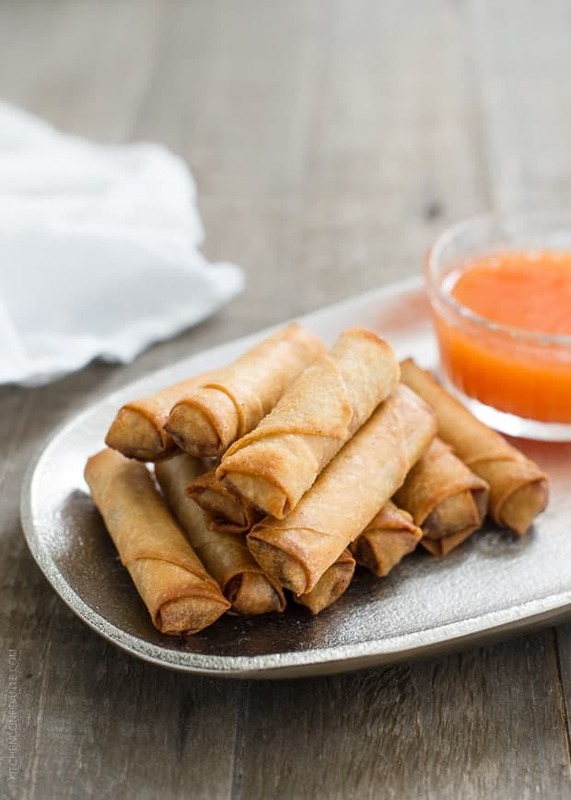 We all know, by now, that lumpia (egg rolls or spring rolls) are delicious bites of savory goodness, but for some reason, lumpia made in this particular style is especially a fast favorite. 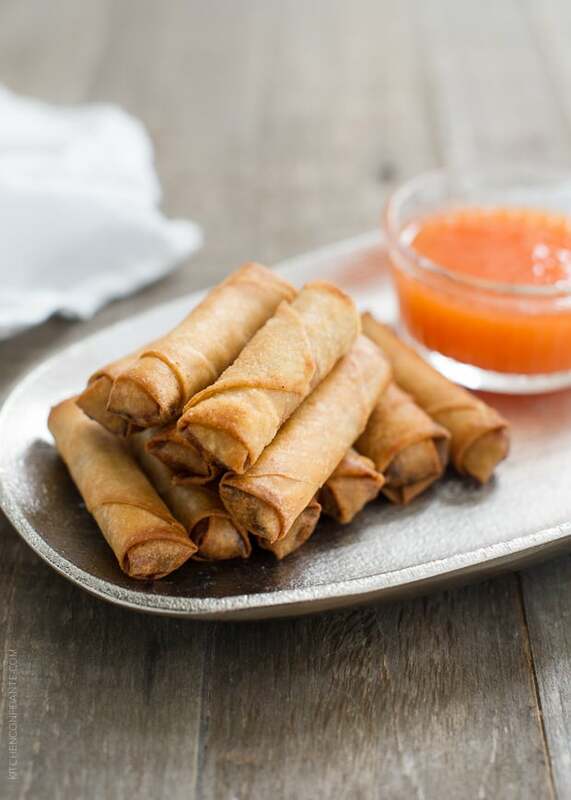 Lumpia comes in all shapes, sizes, wrappers and fillings – and these small finger food sized bites are filled with pork, shrimp, and vegetables. They’re a hit of family gatherings, and they were certainly a hit with my grad school friends. It took a family gathering to motivate me to make another huge batch of Lumpia Shanghai over July 4th weekend. Our celebration took a certain Filipino-American twist, as we we gathered for a mini reunion with my aunt visiting from the Philippines. In true potluck style, there were dishes to feed an entire barrio, and I had already committed to making cassava cake (to my children’s delight), and I decided at the last minute it was time to remedy the lumpia drought. My children adore Lumpiang Shanghai, but they had never actually tried my version, which seems almost odd. 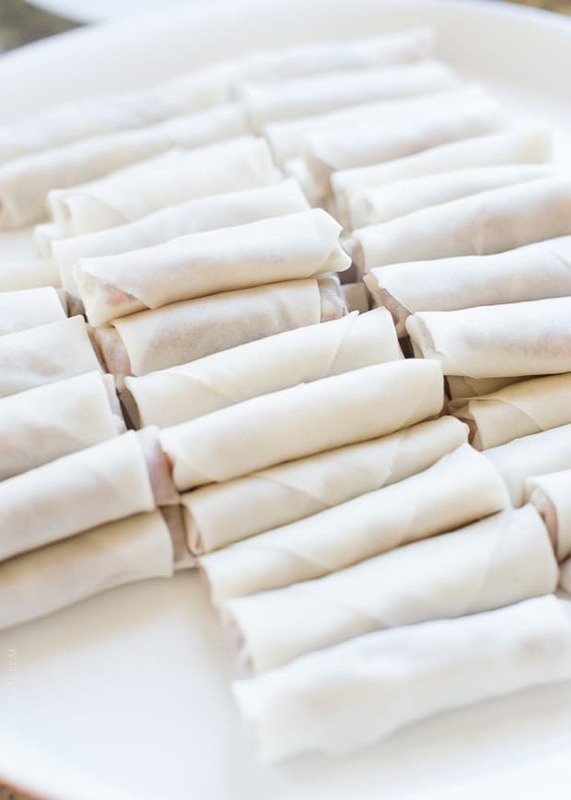 Rolling lumpia – especially this kind – can be quite laborious, but when you are gathered with aunts and cousins, usually everyone chips in and helps out. But I tackled this, again, solo, although my daughter did help. There are some shortcuts – for example, some like to make long lumpias that they slice into smaller pieces, but I much prefer when each roll is individually wrapped, like little presents. It is time consuming, but this labor of love is worth it! I rolled 100 lumpia that day, and now I have extra in my freezer for when the Lumpia Shanghai craving bites. Once we were gathered, my husband was in charge of the deep fryer, and as each lumpia floated to the top, it was with much eagerness (and some patience) that we let the spring rolls cool before biting into them. The thin, crisp shells gave way to the savory filling within – each bite transported me to every family gathering growing up, when these would disappear, to the international nights at school when my mother would introduce my classmates to Filipino food, to that progressive party after a rough year in grad school, to that phone call to my aunt to ask her for her recipe, this one, that I share with you today. Wrapped up like little gifts, I present it to you, and hope you do try it one day for a little taste of home. My home. There’s a reason why Lumpiang Shanghai are the hit of every Filipino family gathering! These Filipino Spring Rolls (Lumpia) are filled with pork, shrimp and vegetables, and are as much fun to make as they are to eat. Make a large batch and freeze some so you will have lumpia ready any time. 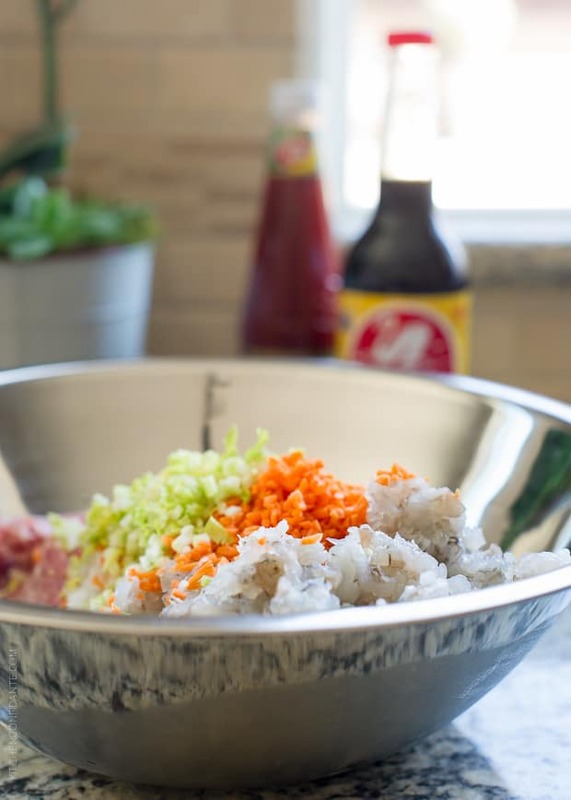 In a large bowl, mix the ground pork, minced shrimp, onion, celery, carrot, soy sauce, egg and a little salt and pepper by hand. If necessary, chop on a cutting board to ensure that it everything is fine and well incorporated. Heat a little peanut oil in a small frying pan, and cook a teaspoon of the filling to check for taste. Adjust seasoning as necessary. The filling can be prepared up to a day in advance and chilled in the refrigerator in a tightly sealed container. To roll the lumpia, I find that it helps to separate the wrappers in advance; cover with a damp paper towel to prevent from drying out. Take the wrapper and place on your work surface on a diagonal so one point is facing you. Place about 1 tablespoon of filling towards the bottom of the egg roll. Turn up the bottom corner and roll upwards. Fold in the left and right corners, making sure the filling is nicely packed, with no air pockets. Continue rolling. Dip you finger in water, pat it on the remaining corner and finish rolling the lumpia, sealing the edge. The lumpia should be about 1/2 inch in diameter. See the GIF in the post illustrating how to roll lumpia for reference. Continue rolling until your lumpias are done, there should be enough filling for about 125 lumpia. 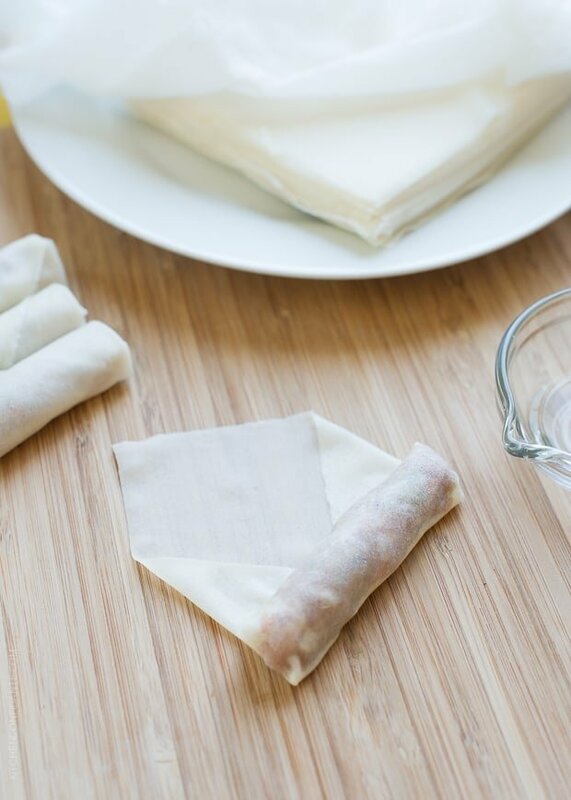 Keep the lumpia covered in a single layer in the refrigerator with a damp paper towel over top until ready to fry, or freeze in an air tight container for later. 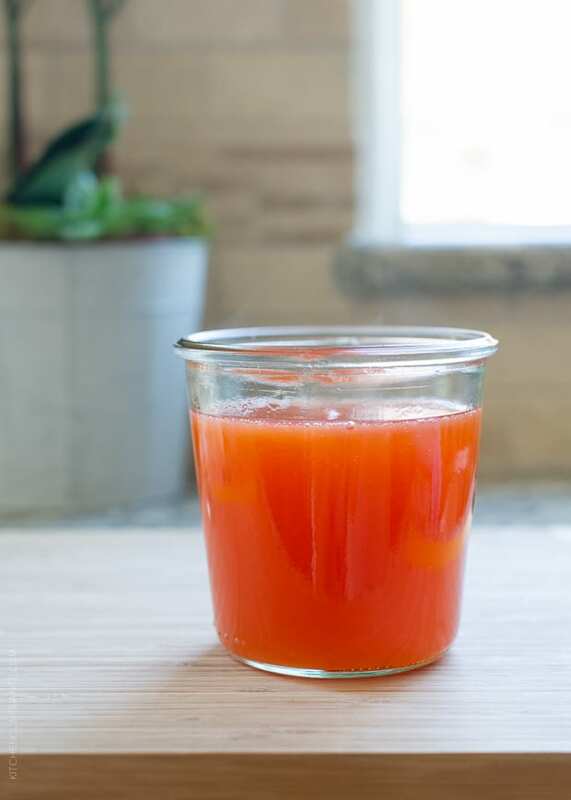 Make the dipping sauce by combining the vinegar, water, sugar, banana ketchup and salt in a small sauce pan. Bring to a boil and stir. Lower the heat to a simmer, and cook until it becomes thin and clear, about 5 minutes. Take a few tablespoons of the liquid and create a slurry with the cornstarch, whisking until smooth. Stir in the slurry into the sauce, whisking constantly, to thicken the sauce. Set aside. To fry the lumpia, heat the peanut oil in a deep fryer or deep sided skillet to 350 degrees. Working in batches, add the lumpia about 4-6 at a time, and fry until golden brown. You will know the the lumpia are ready when they are golden brown, and the filling is fully cooked; this should take about 4 minutes for freshly rolled lumpia, or about 6 minutes for frozen. Let the lumpia drain on a rimmed platter lined with paper towels – my Tito Alex recommends placing the lumpia standing up (like soldiers) so they do not get soggy. Serve immediately with the sauce (it’s also wonderful with Jufran Hot Banana Sauce). This recipe comes from my dear Tita Leah, as she described it to me over the phone many years ago. It works like a charm every time. That was a grea night filled with so many great dishes and amazing friend! Thanks for the memories and great recipes!! I adore spring rolls and love your story that goes along with it. YUM. 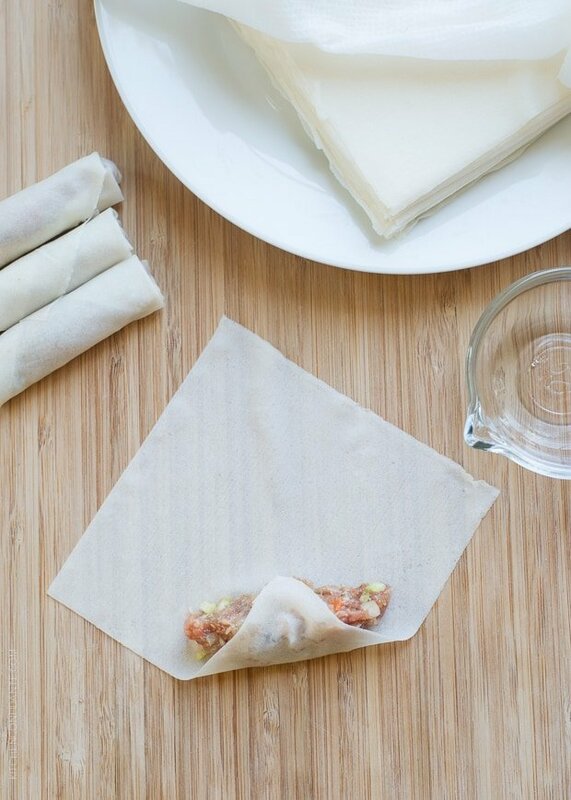 These look amazing and I must add, what nice rolling skills you have : ) Your spring rolls look like restaurant quality! I’d be eating these as fast as they’d come out of the deep fryer! They look incredible! There was a Filipino restaurant we went to ALL the time when we lived in Charleston and I got Lumpia EVERY time. I haven’t been able to find any since. I am so excited to see your recipe. Will definitely have to try! xo Pinned. Always been my fave everytime my lola cooks this in the province! :) It says, peanut oil for frying, is this better than palm or vegetable oil? Hi Christopher – apologies for the very late response, this slipped past me! Palm oil will work for frying. Like peanut oil, palm oil also has a high smoke point, so that will work. As for vegetable oil, I would opt for the peanut or palm oil instead. Hope that helps! I have lumpia in my freezer that my brother in law made me for Christmas. Soooo exciting!!! Hi Mel! Yes, you can replace the shrimp with either more pork or more vegetables, if you prefer. I hope this helps! Would regular ketchup be fine instead of the banana ketchup? Yes, of course, but I might add a little sugar to the ketchup to mimic the sweetness in banana ketchup. Enjoy!! Hello can I freeze in a bag and when cooking from frozen do I thaw them out or just cook them frozen? Yes, I do this all the time. I freeze half the batch in a freezer bag, and when cooking, I cook from frozen. No need to thaw. Cooking time from frozen is indicated in the recipe. May I ask, how can we make it still crispy until the next day? Say for the next 12 hours, is it possible Chef ? The lumpia, when cooked and stored in the refrigerator overnight, will not retain its crispness, but you can make it crispy again by reheating in a 350°F oven for about 10-15 minutes. Do not use a microwave, that will make it soggy. Hi Gigi, ideally, serve the lumpia immediately! As I mention in the recipe, when you remove the lumpia from the deep fryer, line them up on a paper towel lined deep sided tray on their ends, and that will help keep them crispy. If you like, you can keep a tray of them in a 175°F oven to keep them warm. Hope that helps! Can th e se be frozen before the filling is cooked? Hi Kelly, just to clarify, the filling is never precooked before filling. So yes, the lumpia can (and should, if preparing in advance) be frozen after rolling and can be fried from frozen (no need to thaw). Enjoy! These look delicious! How do you store them in the freezer? Do you need to put wax paper or anything to make sure that they won’t stick? Hi Monique, great question. I place the lumpia in between layers of wax paper (not individually, but simply a large sheet to divide rows) in a freezer bag. I find that helps when I want to fry smaller batches. As for sticking, it also helps, and thankfully, the lumpia do not stick together too much! I hope that helps! Hi! I am excited to try your recipe and for sure I will be having all this to myself! haha! Anyway, I just wanna ask if I can replace the shrimp with dried shrimp or hibi as we call here in the Philippines. I was thinking of soaking them in water to soften them a bit before adding it to the mix. Thanks! Hi Grazie! I haven’t tried it with the hibi, but I’m sure that would be delicious! Please let me know how it turns out for you! Ate, pwede ba ibake? Ayoko sana mag fry. Salamat! Hi, Jazmine! Hindi ko pa nasusubukan, pero siguro pwede mong ibake. Try brushing with oil and baking in a 425°F oven for 15 minutes or so. Let me know how it turns out! I’ve been asked to make these for a wedding shower. Can I cook them ahead of time and freeze them? and then warm them up? Or can I freeze them raw, and then bake them at the shower instead? What do you suggest? Hopefully you will have two suggestions as I have two questions. Hi Mary, my recommendation would be to roll the lumpia ahead of time (even a month in advance!) and then freeze them, uncooked. Then I would fry it at the party. This would give you the best result. However, it is possible to fry the egg rolls the day before, refrigerate, then reheat in the oven. The key is getting them crispy again, as no one likes soggy egg rolls. Reheat them in a 350°F oven for about 10-15 minutes. I hope this helps, and enjoy the shower! I’m new to cooking and learned it at a pretty late stage in life, like late 30s. Lol. I will definitely give this a try. Looks easy to me. But looks can be deceiving when you’re new to cooking. Peanut oil can be pretty hard to find here in Manila but I have Canola oil and Soya oil at home.